Is art for you? You may love to draw so much so that you doodle on your homework. You may also like to paint, take photographs, or play with picture editing software on the computer. You also may be hooked on types of cartoons, comics, or movies because you appreciate the way they are designed, and want to learn the techniques used to create them. You might find yourself thinking a little differently than your friends sometimes, wanting to discuss the way things look or sound, rather than what the more practical functions might be. If you enjoy thinking creatively, artistically, and enjoy making drawings for no reason other than because it's fun, then art is probably for you. Choosing to follow a path in life that involves art is a serious choice. Being involved in the arts can be rewarding, but it is often a difficult journey. It is important to understand what art is, how it is important, and why art education is useful. It is also important to recognize that it is necessary to advocate and support the arts, in their many forms, so that the journey is made less difficult, and so that becoming successful in life through the arts is not impossible. The following information will help to identify some ideas regarding these aspects, so that if you believe that art is important to have in your life, you will be able to pursue it more successfully. It is sometimes difficult to put one's finger on the answer to the question "What is art?" because there are such a wide variety of opinions and ideas. However, art is something that is real. Today, art is everywhere. It is seen in every nation of the earth. It exists in culture today and has existed since the earliest civilizations thousands of years ago, as seen in the collections of many of our art museums. Therefore, one key feature that can be identified about art is that it holds an important place in our world; one that cannot be shaken by the test of time. What is it that makes art so necessary to us? It is not easy to say why art is important. Art communicates, yes, but what, and how? Most art theorists would say that art expresses beliefs and ideals, concepts of beauty and truth, and elevates the human condition to a higher plane. For these reasons, it would seem that art has benefits and purpose. But, to a high school student, art education also has other benefits. The world of art is a safe place for people to play with ideas, to experiment with concepts, and to invent new realities of the imagination. This approach to learning is equally as important as understanding all the basic facts of science, math and reading. The combination of both factual reality and creative imagination produce the ideas that create the new, innovative, higher quality products and services that we depend on every day to make our lives more enjoyable and efficient. Removing this piece from our educational system might be a negative stepping stone toward removing the inventive spirit from our civilization. "Art". This animated music video of artistic ideas is by Director Andrea Dorfman and set to the Tanya Davis song, "Art." Have your volume turned up for this catchy tune! "If you are looking for something to be brave about consider fine arts." "Art is the imagination expressed through the senses." "To do what others cannot do is talent. To do what talent cannot do is genius." Is it important to design? Think of design as the part of any innovative process that takes a creative idea, no matter what the subject, and turns it into a meaningful experience that is accessible and real. How does the idea get to be real? All the factors that go into building an idea into reality have to be connected, or designed. Deciding how the elements should be connected is the act of designing. Having the knowledge to understand how to think in terms of design, combined with raw, creative talent can reap great rewards for a person who wants a career in any field, creative or not. Design is how we make things work. It is somewhat an organizational task, that puts things in order, usually the most productive order. Design utilizes a higher level of thinking, because it takes parts and organizes them into a whole that efficiently and effectively produces a greater experience. A good artist will utilize design intuitively. A commerical artist depends on design to push products and services into the level of art, making them appealing to target audiences. Classic design has principles and elements. These are the rules, or the grammer for all forms of design, including visual, tactile, auditory, verbal or written. In music, for example, contrasts in rhythms and harmonies help listeners to perceive what the "meaning" of a song is, and without these elements of design, the song would not be as understandable, and thus enjoyable, regardless of whether it is a "sad" or "happy" song. Artists play with the rules of design. They imagine, create, innovate and invent new approaches to our experiences, by employing and manipulating the rules of design. They play with these rules, make adjustments to them, bend them, fix them, reinvent them, and present them for others to enjoy, appreciate, or utilize. They invent new ways of perceiving, as seen in an Impressionist painting or an I-Phone. Even the sense of taste can employ design. Think of those sweet and sour dishes that people cook which use the principle of contrast in cooking. Chefs produce savory experiences using design - they design culinary experiences. "Good design is a lot like clear thinking made visual ." "Design is a conscious effort to impose a meaningful order." "Design should never say, 'Look at me.' It should say, 'Look at this.'." "The way things look is not irrelevent to the way things work: how they work is how they should look." "Create your own visual style...let it be unique for yourself and yet identifiable to others." What is it that makes design so necessary to us? "A designer is a planner with an aesthetic sense ." "Design is directed toward human beings. To design is to solve human problems by identifying them and executing the best solution." "I think design covers so much more than the aesthetic. Design is fundamentally more. Design is usability. It is Information Architecture. It is Accessibility. This is all design." Design is everywhere. While design is used for art, and for marketing, it also used for the creation of better products and services such as games, toys, transportation systems, communications systems, clothing, computer software, furniture, strategic planning in any business or organization, and biological ecosystems (botanical gardens, zoos). Artistic-minded people naturally find themselves playing with design, or designing, whether it is an important exercise or simply for fun. They enjoy creating rhythms, harmonies, contrasts, and emphasis to punctuate their ideas of beauty or ugliness, the serious or the comical, what is mysterious or what is whimsical. In an art work, design is used to increase the intensity of an aesthetic experience. In an advertisement, however, design is used in order to communicate messages more effectively. Perhaps to design is to "guide" the experience. The lessons learned in an art based design class are not how to make things appear "pretty" but rather how to guide, and thus elevate the audience's experience, whether via the eyes, ears, or other senses. In the art world, the term "design" is seldom used, due to the overarching focus on the aesthetic content or meaning that is looked for in a work of art. In the commerical art world, however, the word "design" is almost exclusively used as the term for creativity. Advertising and marketing agencies depend on "designers," not "artists." Perhaps, while the "meaning" of art is controlled by the artist, the "content" of an advertisement is controlled by a business-person. Thus, the "commercial artist," puts the "artist" part away and simply "designs" material for the business client. This could seem depressing at first. However, consider that a good artist will have a good sense of design, and that design thinking is a highly marketable and appreciated skill in the business community. An artist can make a significant contribution in the business market by using their skills in design. 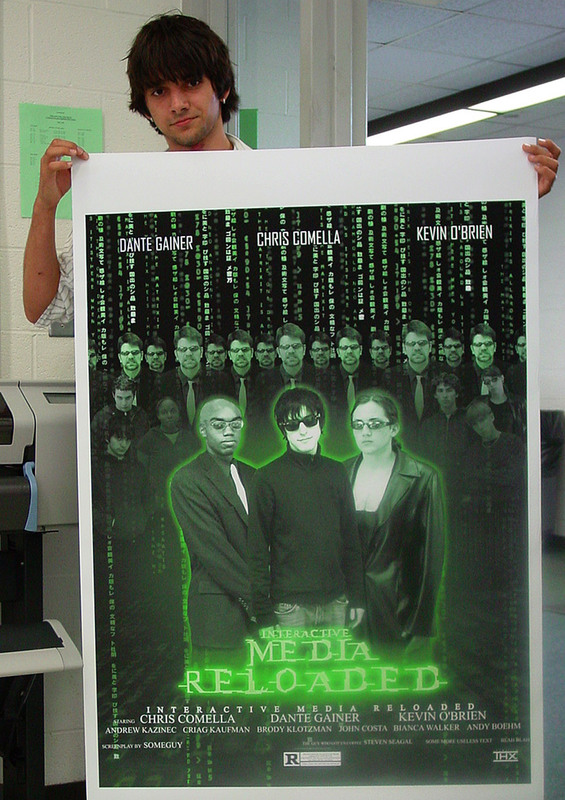 It has not been uncommon in the past for artists to have designed commerical material as well. Andy Warhol actually got his start as a commerical illustrator, and the list goes on. All people utilize design in some form in their own lives; arranging their garden, decorating their home, planning their dinner party, or planning a vacation. But there are "great" designers. To be able to see and deconstruct the design in any thing that you can identify is a way to understand the interdependency of its parts, how they each function, and how they each contribute to the final idea, object, experience or environment. However, to be able to produce the method in which the parts will integrate to successfully accomplish an idea, that is the work of a talented designer. This skill is highly analytical and highly important in any career. "Good design is a renaissance attitude that combines technology, cognitive science, human need and beauty to produce something that the world didn't know it was missing." "What is design? It's where you stand with a foot in two worlds - the world of technology and the world of people and human purposes - and you try to bring the two together." "Math is easy. Design is hard." "Accessible design is good design." "If design isn't profitable, then it's art ." Why be a digital design artist? It goes without saying that a person who can draw can learn to use a computer, but it doesn't work the other way around. Therefore, artistic talent or a good sense of design is always going to be highly prized. However, it is difficult to argue that the computer has become a new 21st century medium for art, as well as commercial design. Artists who limit their computer exposure today are limiting their options, both in their career and in their creative avenues. Digital art and design is defined by its process, which depends highly on the computer. "Going digital" doesn't mean you give up using traditional methods. Rather, since most media today are processed via computers, any traditional drawing, painting, photography or video would be imported into the computer for additional processing. At first computer art was clunky, but today it is seamless. Since the invention of the computer, the worlds of art and design have slowly migrated over to this technology. At first it was extremely expensive so that only the largest businesses could employ the new effects that could be produced by computer graphics. 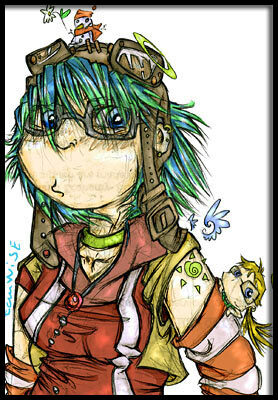 In the 1990's things really took off for digital art, specifically in the realm of affordability. By the beginning of the 21st century, digital art technology was affordable to most average consumers. Today, due to affordability and efficiency, the entire design industry has gone digital. Additionally, many artists today are also employing these tools in the fine art field. There are wide variety of art-based computer software products available today that incorporate every aspect of the traditional creative processes, to include drawing, painting, airbrushing, photo editing, video editing, special effects video editing, animation, three dimensional design (sculpture, architecture, products, automobiles), and sound editing. What is it that makes "going digital" so necessary to us? Digital art technology has changed the aesthetic landscape for art and design. Today, movies, photographs and colorful abstract images have a different look and feel that is robust and rich. Architecture and automobiles actually look more dynamic today because of the effects that computer design software has had on their production. There now is a vocabulary of aesthetic effects that can only be created on a computer. Great designers and artists are playing with these tools, and coming up with new techniques and styles all the time. Digital technology has also increased efficiency. 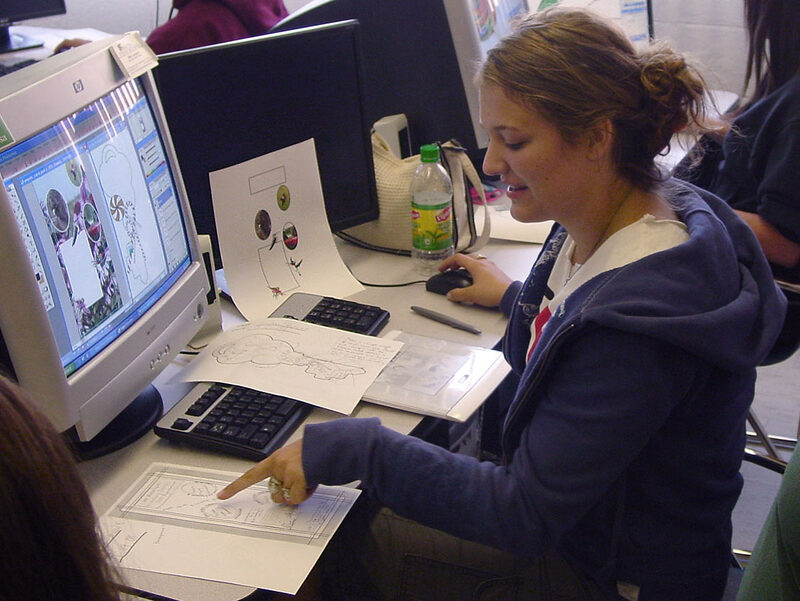 Artists often use computers for sorting out design problems, before executing the artwork in their favorite medium. Additionally, most businesses, including the manufacturing industry, the commerical design industry and the entertainment industry are saturated with computers that solve all kinds of problems. A simple typesetting job can be completed with ease by a child in an elementary school today and utilize more aesthetic options than a tradesman could have accomplished a quarter century ago, simply because the computer has made it so easy. Today, kindergarden children are being taught with technology more and more. Children are making podcasts or web pages for book reports, for example. 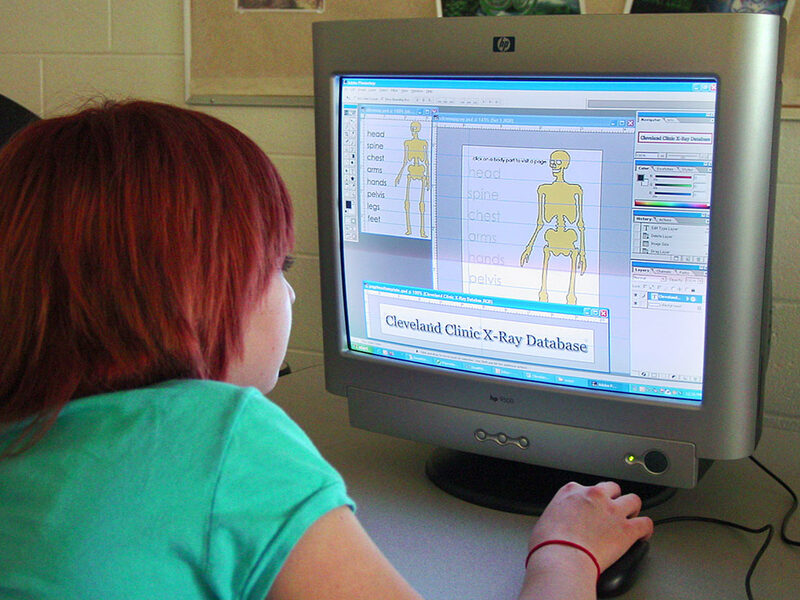 Computer technology is mandated in the public school curriculum. 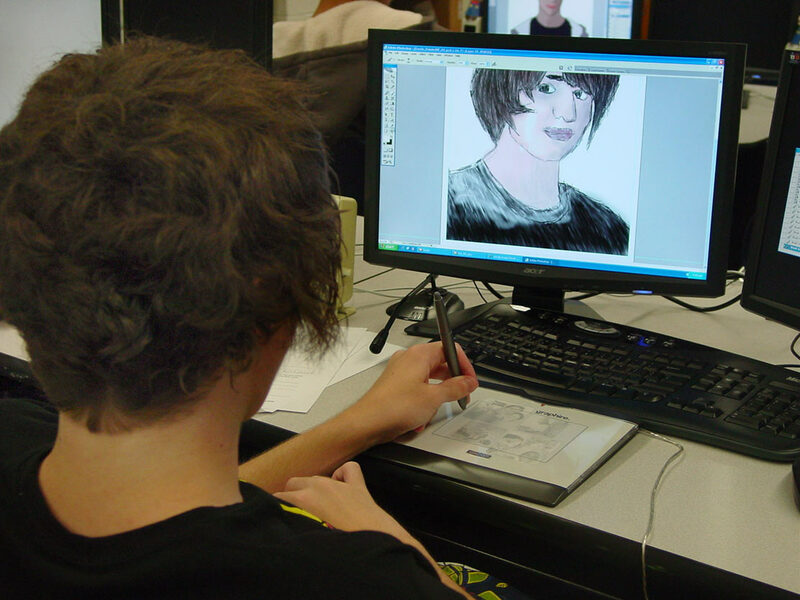 Many art departments have digital art classes today as well. 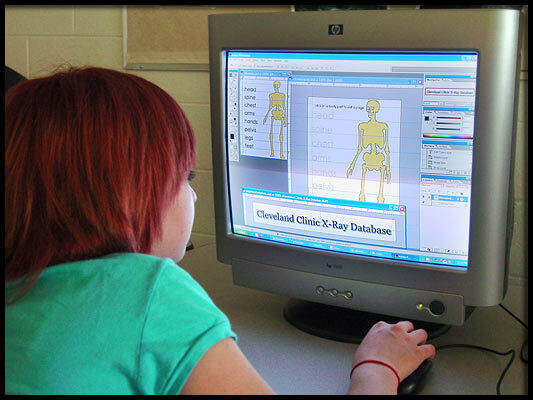 This is because it is recognized that computers are central tools for success in the 21st century. Almost all jobs in the commerical art industry today require computer skills, not to mention that most jobs require computer skills of some sort. Consider the advent of the internet in the last twenty years, and all of the jobs producing content for the World Wide Web. Computers produce this content, which is then viewed on computers. Consider telecommunications, and the changes in our communication devices, which are slowly becoming portable visual and sound media players, playing content that is produced on computers. 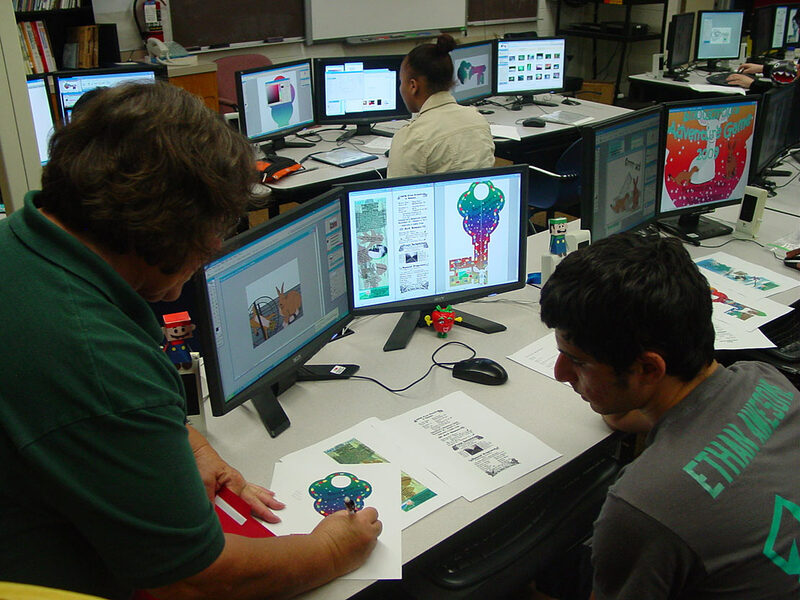 A person who is trained in computer graphics applications can utilize their skills in the corporate design industry, the entertainment industry, or in the fine arts. It is interesting to imagine what kinds of new jobs will be created out of new technologies in the future. Jobs of the future will most likely continue to increase their need for computer skills. It is highly likely that the designers that support the economy in the future will continue to employ digital art tools. It is also quite possible that the artists that theorize about culture will see digital technology as an integral element in the future of art. "Digitally created artwork has emerged along with the rapid development in computer technology and is showing up in many galleries. It has also revived the age old question, "Yes, but is it art?" "Computers are to design as microwaves are to cooking ." Why be a digital Interactive Media design artist? You now have an understanding of why art, design, and digital technology are important. If you find them all interesting, there is a good chance that Interactive Media may be for you. 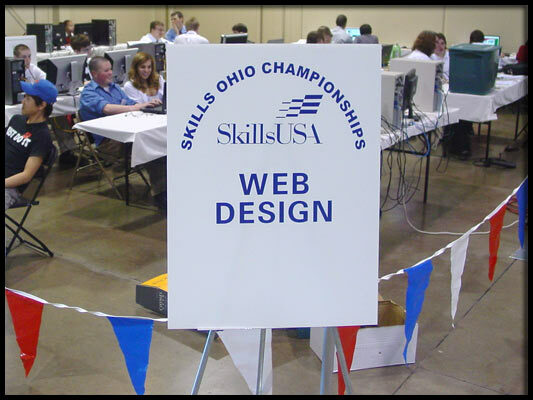 If you think you might be interested in making web pages about something, or designing a game where fun things happen, or creating a simulator to help people learn how to do something, then you are interested in Interactive Media! 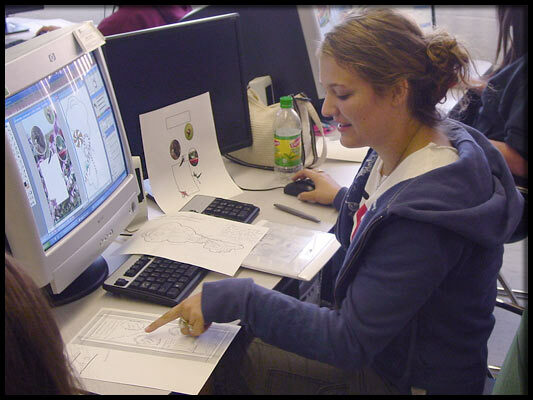 Interactive Media is one of the most challenging career fields of the 21st century, because it incorporates art, design, and digital technology and then adds the highly complex factor called the user interface. Interactive Media designers are highly aware of how their audience interacts with the media they produce, because, quite often, the audience does. Can you make this experience fun, artistic, aesthetically pleasing, funtional, simple, and organized? Can you anticipate how people will respond and then design accordingly? What is it that makes Interactive Media so necessary to us? It is unquestionable that Interactive Media Design and Technology markets are growing. Interactive Media markets include the world wide web, the game design industry, design of simulators (including games like the Wii), and other aspects of the telecom industry such as smart phones (iphones and android phones). All of these markets are experiencing rapid growth and the future trends are not looking any different. 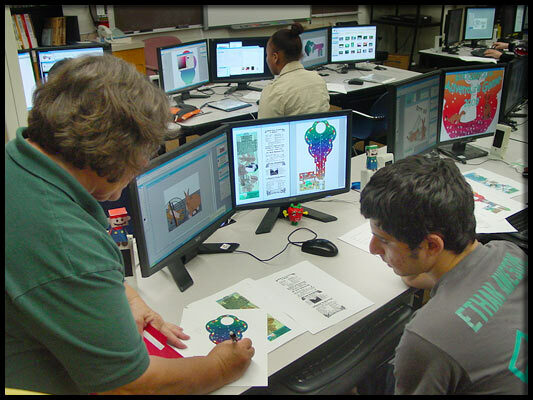 Therefore, Interactive Media designers have been becoming one of the most common types of graphic artists in the commercial art industry. Today, even creative, fine artists are making Interactive Media art. This form of digital art and design is very rewarding, with most 21st century design careers moving in this direction. Students learn high level problem solving skills, such as incorporating functional with aesthetic design. Determining how users interact with content requres high level thinking skills. Making the user experience organized, easy to use, and pleasant requires thinking on multiple levels. Great dancers are not great because of their technique; they are great becuse of their passion. "You can dream, create, design and build the most wonderful place in the world, but it requires people to make the dream a reality."